Some stories of a great many US military aircraft coming into Howard hit the social media. 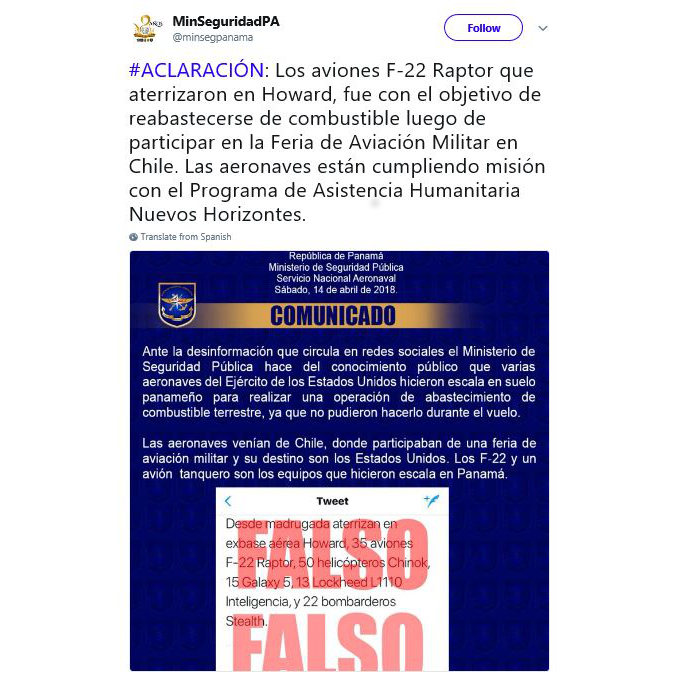 The National Aeronaval SERVICE (SENAN), which is in the family of the National Police and under the aegis of the Ministry of Security, responded that it was fake news. The planes were Chilean, headed to an air show in the United States. Wait a minute — Chile has the F-22 Raptor, a stealth fighter plane? Actually, not. Their superstar aircraft are refurbished F-16s, hand-me-downs from the Netherlands. Uh huh. Stealth fighters are “humanitarian” tools. So we know to at least partly disbelieve. We may not know the whole story from this end. But years ago, The Panama News reported that despite the US Air Force withdrawal from Howard at the end of 1999, there was a skeleton crew of US military contractors, at least one dedicated hangar and pre-positioned fuel and other supplies to make Howard an instantly available “forward operating location” for US forces. We stand by that story. A right-wing character who has since fled Panama after having been a shill for Petaquilla Gold pump and dump stock swindles reviled The Panama News for reporting that, with mocking references to black helicopters. However, whatever all those military aircraft were doing at Howard and wherever they were headed, the place is indeed a forward operating location for foreign military forces. A straightforward admission of this gets the Panamanian government in to legal and political problems, but there it is.